Join Sarah Auerswald of Sarah & Sons / MomsLA and me (Beth Blecherman of TechMamas.com) as we discuss kids’ online habits with PixyKids, the soon to launch interactive and engaging social media platform where kids 6-12 can create, share, learn, and have fun through their personalized digital space. 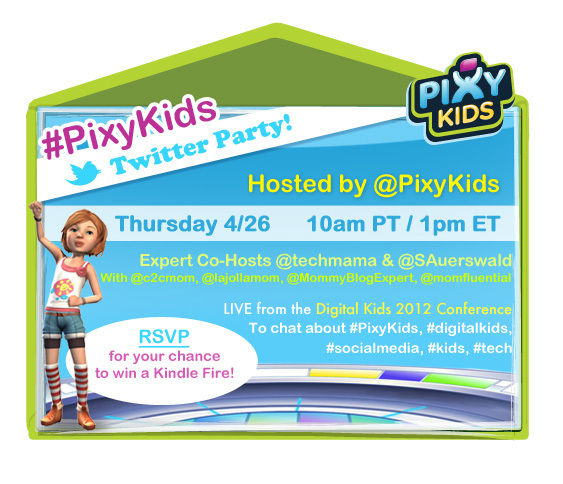 We’ll be on Twitter Thursday, April 26, 2012 at 10am PST with Hashtag #PixyKids – and we’ll also be live at the Digital Kids conference taking place in Pasadena. We’ll be joined by expert panelists Ciaran Blumenfeld of Momfluential.net, Katie Dillon of LaJollaMom.com, Heidi Leder of Coast2CoastMom.com, Janis Elpas of MommyBlogExpert.com. RSVP by clicking HERE – to sign up at the PixyKids blog for a chance to win one of our prizes! For more details, here is the post on the PixyKids blog. PRIZES: One Amazon Kindle Fire and 2 $50.00 Amazon gift cards. You must RSVP here to be eligible to win, so be sure to click over!